Manchester City have achieved a Premier League 'first' by launching an app for Amazon Fire TV. 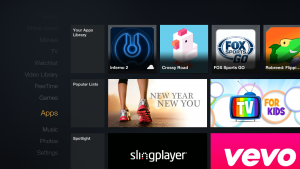 The app allows City's global fanbase to stream their CityTV videos directly onto a connected TV via the Amazon Fire TV platform. The content includes behind-the-scenes tunnel access on match days, Pep Guardiola-led training sessions, player interviews and special features, such as 10-part series Global City. Last season the CityTV YouTube channel was the second most popular football club channel in the world, with the equivalent of 150 CityTV video views every minute of the year. The app follows the launch of Facebook Instant Articles, an official Manchester City Apple News page, and an official sticker set for iMessage, which all went live earlier this month.